During 2011 drought conditions in the ACF basin provided an opportunity to document streamflow and groundwater levels under these extreme conditions. Over 350 water levels were measured in wells and streamflow was measured at 212 streams or springs. 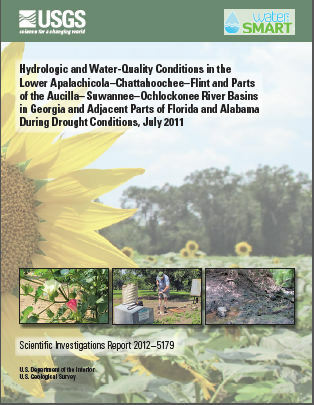 During the first year of the study (2011), exceptional drought conditions prevailed in the lower Apalachicola-Chattahoochee-Flint and adjacent Aucilla-Suwannee-Ochlockonee River basins during the summer months. Cumulative rainfall departures from 1981-2010 climate normals were in the range of 17 to 27 inches, providing an excellent opportunity to measure streamflow and groundwater levels under extreme dry conditions. Measurements indicated that 12 of 43 surficial aquifer wells and 128 of 312 Upper Floridan aquifer wells had record-low water levels. Most streamflows measured were below normal (< 25th percentile), with 286 miles of streams losing flow in the downstream direction and 606 miles of streams were dry. These data are important for understanding how the system functions under low-flow conditions and were used to calibrate surface water and groundwater flow models. The results of the synoptic study are published in a USGS Scientific Investigation Report (Gordon and others, 2012). Drought Conditions in the lower Apalachicola-Chattahoochee-Flint River Basin in July 2011: USGS measured streamflow at 267 sites in the lower ACF Basin and western and central parts of the Aucilla–Suwanee–Ochlockonee River basin during July 2011 to measure the effects of drought and irrigation withdrawals on streamflow. In this part of the basin, water pumped from the upper Floridan aquifer reduces flows in larger streams such as the Flint River and can completely dry out smaller streams. Stream reaches shown in red are losing water to the upper Floridan aquifer, blue reaches are gaining water from the aquifer, brown reaches are completely dry. Drought conditions in 2011 resulted in nearly half of normal rainfall (17-27 inches below normal). Twelve of 43 surficial aquifer and 128 of 312 Upper Floridan aquifer wells measured had record-low levels. Nearly 300 miles of measured streams were losing water (streamflow decreased downstream) and about 600 miles of streambed were dry. Below are other science components of the Apalachicola-Chattahoochee-Flint River Basin Focus Area Study. As one of several National Focus Area Studies within the USGS National Water Census (NWC) the USGS completed a 3-year study of water availability and use in the Apalachicola-Chattahoochee-Flint (ACF) River Basin. A hydrologic model that simulates streamflow conditions in the ACF Basin was constructed using the Precipitation Runoff Modeling System. The model simulated development by including withdrawals and returns, interbasin transfers, storage in unmanaged reservoirs, and impervious surface. In the lower Chattahoochee and Flint River Basin, a groundwater flow model was developed to simulate the effects of groundwater withdrawals on streamflow. This model was linked with the streamflow model to improve estimates of baseflow conditions during critical times, such as droughts. Below are publications associated with the Apalachicola-Chattahoochee-Flint River Basin Focus Area Study. Gordon, Debbie W.; Peck, Michael F.; Painter, Jaime A.
Hydrologic and water-quality conditions in the lower Apalachicola-Chattahoochee-Flint and parts of the Aucilla-Suwannee-Ochlockonee River basins in Georgia and adjacent parts of Florida and Alabama during drought conditions, July 2011; 2012; SIR; 2012-5179; Gordon, Debbie W.; Peck, Michael F.; Painter, Jaime A.